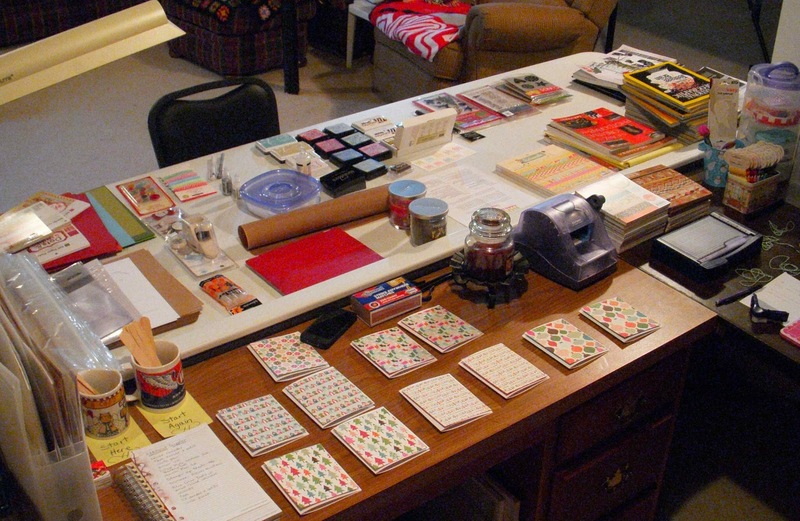 This should be titled "What ISN'T On My Workdesk", because I've hauled out a big stash of supplies to immerse myself in some serious Christmas card-making. It really is organized chaos around here. I've been making a single card, then kitting supplies to make multiple copies. I have a big crop on Friday - an entire day of shopping and making cards with my sister and best friend! 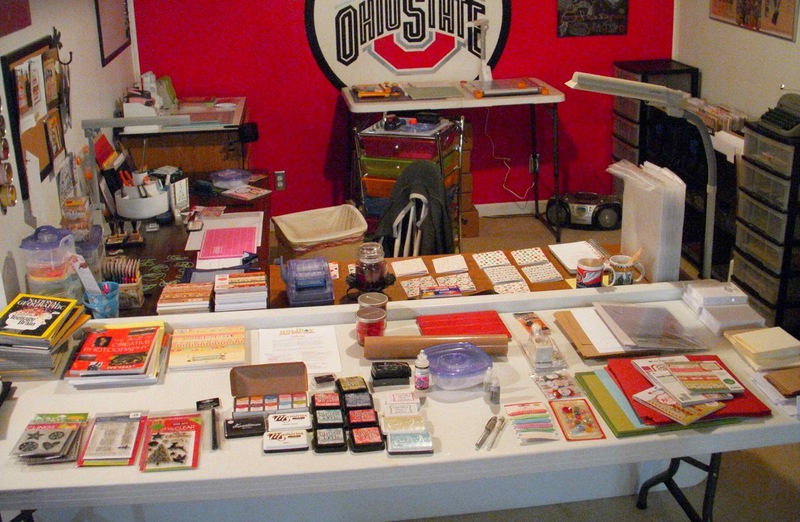 And during this whole process I couldn't help but indulge in a little scrap room re-organizing. 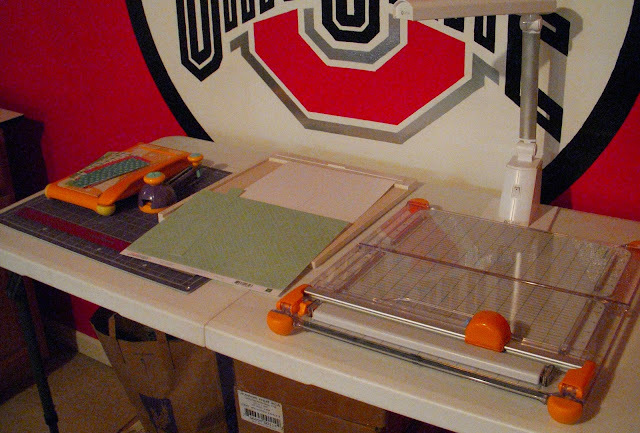 I now have a die cutting/dry embossing station that is at stand-up height. Die-cutting multiple shapes on a too-low table really made my back ache! My ever-resourceful husband found an extra table in storage and set it up for me, so I could move my trimmers, circle cutter and score board to a new area. This is also at the perfect height for standing. He even bought me a new Ott light. I feel positively spoiled. Here are the kits I've assembled so far. After all this work, I've only completely finished a grand total of 6 cards. (go ahead and laugh, that's exactly what Phil did) But I'm ready to make about 50 more at the crop. Any Christmas crafts in the works on your desk? oh an all day crop sounds like so much fun! love all the kits you are making! i always have to have my kits when i go to a crop! You look beautifully organised. I've been cutting on the floor! which isn't good for the knees. I need another table. .
That looks incredibly organized! Hope you have fun at making cards at your crop. Wow that's so organised - I'm jeal;ous of your die cutting station, I have to haul mine out of a cupboard and set it up in the kitchen when I want to use it! Sorry! added the wrong web addy!! I said, aren't you organised!! I never have enough space to put things...which is why I'm drawing my next digi on the dinning room table! Have a great week and good luck with the making of all those Christmas Cards!! HaPpY WoYwW!?! wow, you have an amazing work room! love Christmas card production line! I am impressed. That looks super neat and organized. Love it! And I think it sounds like you've made great progress on your cards! Such organisation! I don't know if I'll EVER get around to making Christmas cards this year! Fantastic craft room, love all the stations, looks like you are ready to start your production line. Sarah #around the 155 mark if I remember rightly! nope, i remembered wrongly, it was #115! Loving your new stations! I have a standing height desk and LOVE it!!! Your cards/kits look awesome :) Can't wait for the after pics. Have fun Friday! It's all so neat a very pretty! Well you're doing Christmas, you're changing things up and making improvements and I can only see organised...this room does not speak chaos to me! What I can see of your 'master' cards are lovely - and the spread across your desk is glorious! That's a super organised room and an amazingly organised way of making Christmas cards, but you need to lose the red, paint it blue and gold, lol!! Sue - your space looks very inviting! Love how you are organizing your cards!! I am impressed! 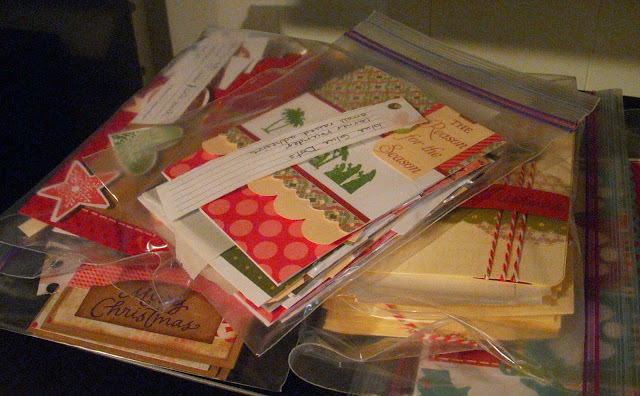 What a great stash, and what a great idea to kit up some cards for a day of crafting. Have a blast at the Mini Meet! I'd just like to come right over & play in that organized chaos. 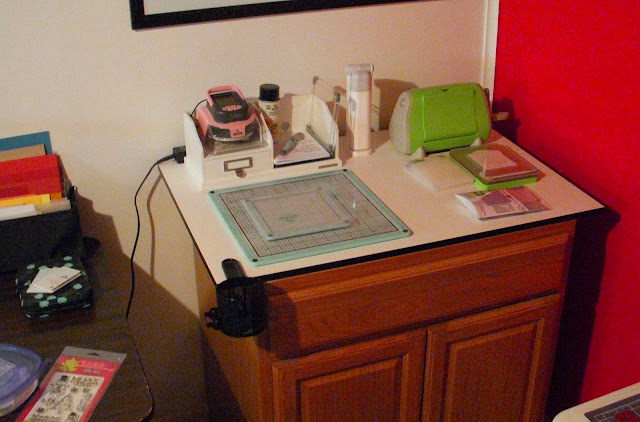 I love the new die cutting station! Have fun at your crop. I'm working on Christmas crafts today - a few handmade gifts (altered clipboards & personalized journals) plus my cruise journal. And baking Robbie a birthday cake in between. hi there Sue - thanks so much for popping avoe to my place for a look and a chat - and wow you totally blow me away - how organised some folk are - i have never made more than thee cards in one day I think - but maybe that is not quite right seem to remember going crazy in January and making more than that - but that was a very long time ago in our summer holidays as we call them over here - happy WOYWW! What a wonderful craft space you have. Ok, I am major league impressed. You have inspired me to do a little rearranging and make an assembly line operation for my Christmas cards. Because right now, I'm about where you were when you wrote this - only 5 or 6 done!